An upper arm lift, body contouring of the upper arm, or brachioplasty, reshapes the upper arm to tighten loose skin and remove fat that often creates a “bat wing” appearance under the arm. Removing the excess skin caused by weight loss or natural aging can tighten loose skin that extends from the underarm area to the elbow; liposuction is sometimes used in combination to achieve the best results. Every year, thousands of people undergo successful upper-arm-lift surgery and are pleased with the results. If your weight is normal, but you feel your shape is marred by underarm laxity. If you have lost a massive amount of weight and are left with excess upper-arm skin and fat that may resemble bat wings. If you are willing to accept a scar in exchange for shapelier arms. You will look much better in form-fitting clothes. You will have increased confidence and a better self-image. You will be able to wear short-sleeve or sleeveless clothing without feeling self-conscious. You will have visible scars along the insides of your arms, extending from the armpit to the elbow. If your sagging under arm skin is not excessive, an upper arm lift may not be worth the resulting scars (in this case, consider limited-incision brachioplasty or liposuction). Your surgeon will not be able to predict exactly how your scars will look. These are the top three pros and cons to weigh when considering an upper arm lift. If you want to focus on what is unique to you, please consult with your aesthetic plastic surgeon. Are you a good candidate for an upper arm lift? You have lost the weight you desire, but are left with redundant underarm skin. You are an adult with significant upper arm skin laxity due to aging. Your weight is relatively stable and you are not significantly overweight. You are a healthy individual with no medical conditions that could impair healing or increase surgery risks. You are committed to a healthy diet and lifestyle. How is a upper arm lift procedure performed? Your surgeon will create markings on your elbows, arms and armpits. 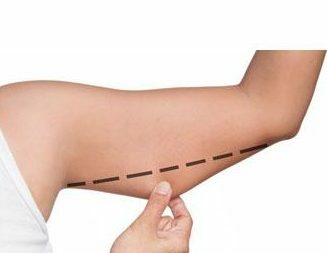 The location, length and direction of these incision lines will be dictated by the type of brachioplasty you will undergo. You will receive either intravenous sedation or general anesthesia, based on your surgeon’s recommendation. Your surgeon will make the necessary incisions to remove excess skin and fat. The incisions may be completely concealed within the armpits or extended down the inside of the arms in the most inconspicuous locations possible. Your surgeon may use liposuction as an adjunct to remove excess fat. After the incisions have been made, your surgeon will remove the excess skin and fat and bring the incisions together to provide a firmer and smoother arm contour. Finally, the skin is smoothed over the new contour of your arm. Your surgeon will close the incisions carefully to minimize scarring. Your sutures may be placed beneath the skin, where they will be gradually absorbed by your body. A sterile dressing and a compression garment will be applied and drains may be placed. The goal of your aesthetic plastic surgeon and the entire staff is to help you achieve the best result and make your surgical experience as easy and comfortable as possible. Your options will be dictated by your skin quality and the extent of excess underarm fat and skin. Your surgeon will help you make the right choice based on your anatomy and preferences. Liposuction: Arm liposuction is an option for you if your skin has enough elasticity to shrink around the remaining tissues after your fat is removed. If your skin has poor elasticity, tissue sagging will be even more pronounced after fat is removed. Liposuction may also be used as an adjunct for fat removal in a standard brachioplasty procedure. Limited-incision brachioplasty: If excess hanging skin is located close to the armpit, your surgeon may be able to pull up and tuck this excess skin into the armpit. This works best if you have loose, crepe-like skin in the lower inner arm area near the armpit and do not have too much excess fatty tissue. Standard brachioplasty: If your excess skin extends like a bat wing from the armpit to the elbow, the only option is complete removal of the arm flab in a standard brachioplasty. Extended brachioplasty: An extended arm lift is similar to a standard brachioplasty, except that the incision is extended along the arm down to the body to include loose skin and fatty tissue that might be just under the arm area along the side of the chest wall. Loose skin in that area is common in patients who have had massive weight loss. What will my upper arm lift incisions and scars be like? Upper arm lift scars vary depending on the amount of excess tissue you have and the elasticity of your skin. Even patients who undergo a standard brachioplasty, which results in larger scars, are usually quite satisfied with the results. Because liposuction incisions are small, the scars are also small. Most liposuction scars fade and are barely perceptible over time. Your scars will most likely be limited to the underarm areas. Incisions are generally placed on the inside of the arm and may extend from the underarm (axilla) to just above the elbow. The standard brachioplasty incision is extended along the arm down to the body to correct loose skin and fatty tissue under the arm area. Liposuction of the upper arm (body contouring of arm). The arm lift incision can extend from the elbow to the arm pit and rarely to the side of the chest. Plastic Surgeons do their very best to keep the incisions as small as possible. After finding a board-certified plastic surgeon in your area who is experienced in performing upper arm lift surgery, you will need to make an office appointment to set up your consultation. Generally, because of the in-depth nature of the consultation, there is a cost associated with the initial visit. During your initial consultation, you will have the opportunity to discuss your cosmetic goals. Your surgeon will evaluate you as a candidate for upper-arm-lift surgery and clarify what an upper arm lift can do for you. Understanding your goals and medical condition, both alternative and additional treatments may be considered. Do you have any medical conditions or drug allergies? Are you being treated for any medical conditions? Have you had any previous surgeries? What are your current medications and vitamin and herbal supplements? What is your current use of alcohol, tobacco and recreational drugs? What is your history with any noninvasive cosmetic procedures? What outcome do you expect from the surgery? What is your chief motivation in undergoing an upper arm lift? Ask you to look in a mirror and point out exactly what you would like to see improved. Take photos for your medical record. Evaluate your health status, including preexisting health conditions or risk factors. Evaluate the elasticity of your skin. Discuss your options and recommend a course of treatment. Discuss likely outcomes, including risks or potential complications. Show before-and-after photos of cases similar to yours and answer any questions. How do I prepare for a upper arm lift procedure? If your surgeon recommends weight benchmarks or lifestyle changes, do your best to achieve them to ensure the best results and minimize the chance of complications. Upper-arm-lift surgery is usually performed on an outpatient bases. Be sure to arrange for someone to drive you home after surgery and stay with you for at least the first night following surgery. Have many pillows on hand. Elevating your arms with pillows can help reduce swelling and increase comfort during recovery. Stock your refrigerator with lots of fruits and vegetables and lean proteins. Lean protein assists in healing. Salt increases swelling, so avoid it! Prepare frozen meals in advance. High-protein, low-sodium soft foods are best for the first couple of days. Decide what you will wear for the day of surgery and the first few postoperative days; pick items that open in front and do not have to be pulled over your head. Wear slip-on shoes. Plan where you will recuperate. If possible, have a speakerphone by your bed and a remote control for the TV. Schedule time off from work, approximately one week or two weeks, if your job is labor intensive. Tend to all of your chores before your surgery, so you don’t have to worry about doing chores during your recuperation. You will not be allowed to engage in heavy lifting for several weeks after surgery. Your upper-arm-lift surgery may be performed in an accredited hospital, free-standing ambulatory facility or office-based surgical suite. Most upper arm lift procedures take at least one to three hours to complete but may take longer. Wear comfortable, loose clothing the day of surgery. It is helpful to wear soft tops that open in front and roomy sweat pants. You will receive medications to keep you comfortable during the surgical procedure. For your safety during the operation, various monitors will check your heart, blood pressure, pulse and the amount of oxygen circulating in your blood. Surgical drains have been placed to remove fluid that accumulates within the incisions. A sterile dressing has been applied to the incisions, and a compression garment or bandage supports your arms to promote healing and decrease postoperative swelling and bruising. You will likely have your arms wrapped from the wrist to the armpit for the first 72 hours. Before leaving for home on the day of surgery, you (or someone looking after you) should feel comfortable emptying and resetting your drains. You may go home on the day of surgery or spend a night in the hospital or an aftercare center with a nurse, unless you and your surgeon have decided on other postoperative recovery options. Under no circumstances will you be permitted to go home alone or stay home without another adult present for the first 24 to 48 hours. Follow your doctor’s recommendation in relation to this decision. You may be placed in a compression garment or wrap immediately following your upper arm body contouring surgery. Wear this exactly as directed. Remove it only as directed for cleansing incisions or showering. You must have a responsible adult take you home and remain with you continuously for at least 24 hours after surgery. Although rare, emergencies do occur. You should have someone help you to the bathroom the first few times in case you experience dizziness or lightheadedness. Drink only liquids for the first few hours after surgery. Advance slowly to small, light meals. If you experience nausea or vomiting more than once, call your doctor. Excessive vomiting and retching can result in bleeding beneath the skin. Gently get out of bed as soon as possible after your surgery. Sit with your legs hanging over the edge of the bed or chair for a few minutes before standing. Begin to walk as much as possible as soon as you can, but do not exert yourself. Avoid strenuous activities that involve arm movement, such as raising your arms over your head or lifting. A balance of rest and reduced activity will speed up your recovery. You will have a mild to moderate amount of pain and discomfort. This should be easily controlled with oral medications. The discomfort and pain should begin to decrease within 48 hours after surgery. If you have a significant increase in pain after this period, call your plastic surgeon. Severe pain is rare; if you experience this, call the doctor immediately. Expect bruising and swelling. These symptoms will peak within the first 36 to 48 hours after surgery and will gradually subside over the next ten to fourteen days. To minimize swelling, sleep with your arms elevated with pillows for two weeks after the surgery. You will need a few weeks to recover and heal from an arm lift/upper arm body contouring procedure. It will be at least one or two weeks before you can return to work and about ten days before you can drive. During the first week, avoid activities that raise your blood pressure, which could cause bleeding at the operative site. Do not subject your incisions to excessive force, abrasion or motion during the time of healing. Walking is the safest exercise, especially during the first week. Avoid exercises that directly stress the area of your surgery for a full four weeks. After a month, you can start cardiovascular activities, such as riding a stationary bicycle or brisk walking. Avoid heavy lifting, contact sports and jogging for up to six weeks. By six weeks after your arm lift procedure, you should be able to resume your normal level of activity. Walking: Although your arms will be sore for several days, you should be up and walking the day after surgery, which is the best way to reduce the chances of blood clotting in the legs. You should be able to resume some of your normal daily activities within several days after surgery. Sleeping: During the first two weeks following your upper arm lift, attempt to sleep with your arms elevated on two or three pillows. This ensures drainage of fluids from your upper extremities, reducing inflammation and tension on your incision lines. Showering: Your surgeon may remove your dressings and wraps on your first postoperative visit, probably within five days of your surgery. You can then take a shower. After showering, simply pat your incisions dry and begin wearing your arm compression garment. Swelling: Arm swelling may take three to five weeks to subside. Keeping your arms elevated, according to your surgeon’s instructions, will shorten this period. Driving: If you are taking pain medication, it is not safe to drive a car within 24 hours, since your reflexes and alertness may be altered. Mild Exercise: Walking, stretching and moving your arms and legs while sitting will reduce swelling and prevent clotting. If you should feel pain or pulling in the incision area, stop the activity. Scarring: Everyone’s body is different and many factors contribute to scar healing. Your scars will be firm and pink for about six weeks. Expect that it will be at least nine to 12 months before your arm lift scars lighten in color and become as flat as the rest of your skin. How Long Will the Upper Arm Body Contouring Results Last? As long as your weight does not fluctuate, you should expect the results of your upper arm lift/upper arm body contouring to last for many years. Your body will continue to age, including your skin. This may lead to loose skin in the future. If you gain considerable weight after the surgery and then lose the weight, loose skin will return. In either scenario, subsequent arm laxity will be far less significant than before your surgery. For safety, as well as the most beautiful and healthy outcome, it’s important to return to your plastic surgeon’s office for follow-up evaluation at prescribed times and whenever you notice any changes in your arms. Do not hesitate to contact your surgeon when you have any questions or concerns. The cost of an upper arm lift varies from doctor to doctor, from one geographic area to another and with the technique that is performed. Because an upper arm lift is elective surgery, insurance usually does not cover these costs; however, if your brachioplasty is one of several plastic surgeries following bariatric surgery and massive weight loss, there is a small chance that it may be covered. Many surgeons offer patient financing plans to make the procedure more affordable. The practice of Michael P. Vincent MD FACS participates with CareCredit. Click on the Logo for more information. See why ASAPS members are widely recognized for upholding the highest standards in the area of aesthetic plastic surgery by viewing their basic credentials, training and certifications. Fortunately, significant complications from body contouring (upper arm lift surgery) are infrequent. This surgery remains the gold standard for arm rejuvenation and is usually performed without any major problems. You can help minimize certain risks by following the advice and instructions of your board-certified plastic surgeon, both before and after your upper arm lift body contouring surgery. A thigh lift is a body contouring procedure that involves the removal of excess skin and fat from either the inner or outer thighs. This is often desirable after substantial or bariatric weight loss or in individuals for whom dieting and exercise have failed to reduce excess tissue in their upper thighs. Liposuction may be used as an adjunct to the recontouring of the inner thigh. If you are committed to maintaining a healthy lifestyle and a moderate weight, a thigh lift can help you regain the youthful thigh contours you desire. These are the top three pros and cons to weigh when considering a thigh lift or lower body contouring. If you want to focus on what is unique to you, please consult with your aesthetic plastic surgeon. Medial (inner) thigh lift: An incision is made in the groin area, and any excess fat and skin are excised along the inner aspect of the thigh. Liposuction may be but is not always included in this procedure, depending on your individual requirements. The area from the groin to the knee is recontoured and the procedure is repeated for the other thigh. If a more substantial wedge of tissue is removed, the procedure is called a thighplasty. Lateral (outer) thigh lift:This is a more complex procedure, usually involving recontouring of the buttocks as well as the outer thighs and removal of more tissue. Scarring is more extensive, and the skin will be less elastic after the surgery, so weight should be maintained. What are my options regarding lower body contouring? What will my thigh lift body contouring incisions and scars be like? During your initial consultation, you will have the opportunity to discuss your body contouring cosmetic goals. Your surgeon will evaluate you as a candidate for thigh lift surgery or other body contouring option and clarify what a thigh lift or other option can do for you. Understanding your goals and medical condition, both alternative and additional treatments may be considered. Make the most informed and intelligent decisions about your body contouring procedure. Confirm that you have the right surgeon for your body contouring procedure. Understand your options, potential outcomes and risks of your body contouring procedure. Am I a good candidate for a thigh lift or other body contouring procedure? Do you have before and after photos I can look at for the procedure I am undergoing? What will be the costs associated with my body contouring surgery? How are body contouring complications handled? How do I prepare for a thigh lift body contouring procedure? What can I expect on the day of thigh lift/lower body contouring surgery? How Long Will the Body Contouring Results Last? The cost of a thigh lift/lower body contouring varies from doctor to doctor and from one geographic area to another. Because a thigh lift is elective surgery, insurance does not cover these costs. Many surgeons offer patient financing plans to make the procedure more affordable. The practice of Michael P. Vincent MD FACS and Brent C. Faulkner MD participates with Care Credit. Click on the Logo for more information. Fortunately, significant complications from thigh lifts are infrequent. Your specific risks for thigh lift/lower body contouring surgery will be discussed during your consultation. You can help minimize certain risks by following the advice and instructions of your board-certified plastic surgeon, both before and after your thigh lift/lower body contouring surgery. © 2017 Cosmetic Surgery Care. All Rights Reserved.